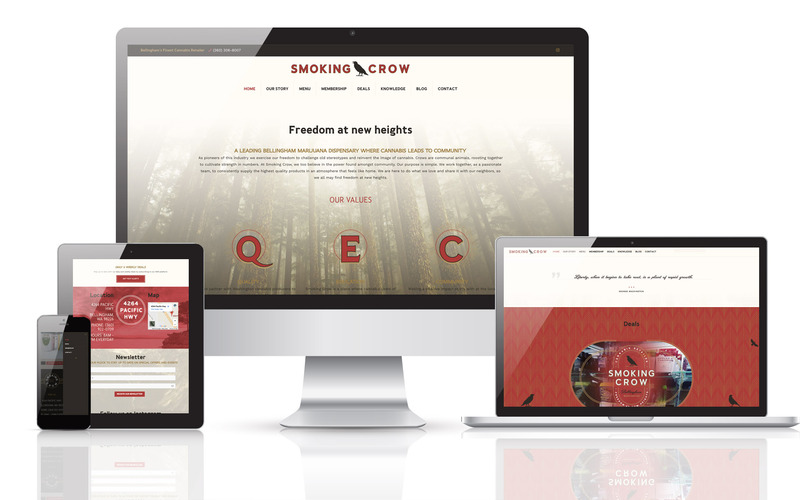 In November of 2017, we were contacted by Potency to work on a project for a new dispensary in Bellingham, WA called Smoking Crow. After meeting with one of the owners at MJBizCon, we began designing their website in preparation for a January launch. It was clear from the outset that they were thoughtful, cared deeply about the science of the plant, and most importantly about educating their customers. With that in mind, we created something that fit their brand and ethos. This was our first project working alongside Potency, and using their branding made our design process feel effortless. Carefully curated photography along with the unique color scheme helped us design a site that was aesthetically pleasing, classy, and modern. One of the great features of this site is the Baker menu. We split the menu into flower, extracts, and edibles allowing for much better UX for the end user. affect your trip to the top? A beautiful, functional website is an excellent marketing vehicle for a business, but without SEO it is much like paying for a billboard in the middle of the desert. SEO helps your website get more visitors, and can greatly increase your rankings on Google and other search engines. Having a pretty website on desktop is wonderful, but it is vitally important that websites be mobile-friendly. Statistics show that about 60% of users are hittiing websites on their mobile phones. Google penalizes rankings for websites that are not mobile-friendly. That is why we extensively test all our websites on a variety of devices and browsers to ensure that they function properly, and look just as beautiful as they do on desktop.